This post continues our analysis of the architecture of international security. In The Topology of Global Power, we explored the centered RSC of North America and the Asian supercomplex. In the latter, we saw how South-Asian security dynamics are decoupled from those of East Asia with threats traveling only in one direction. Hence, a good place to begin is the land of my birth. Regional security complex theory began with efforts to understand security dynamics in South Asia. This is a textbook case of an RSC. The security dynamics are largely self contained. The complex was born in the traditional way: with a bloody war. The British Raj ended in 1947 with the coming to power of a labor government in Westminster. Elections had been held in 1946, and despite the fact that parties that supported a united India won even in what was to become Pakistan, the British in their infinite wisdom choose to partition the country. The partition was itself bungled by British administrators resulting in widespread ethnic conflict as more than ten million people were displaced and perhaps half a million were slaughtered in the worst episode of ethnic cleansing the subcontinent had ever witnessed. The nascent states immediately clashed over the contested territory of Kashmir. The Hindu king of this princely state ruling over a largely Muslim peasantry had acceded to India after much dillydallying. Pakistani irregulars immediately started infiltrating the state. Soon it became an invasion and Delhi sent in the Indian army. The war ended with a UN brokered cease fire in 1948, establishing the Line of Control (LOC) where the armies face each other even today. The two countries fought each other thrice after: 1965, 1971, 1999. The biggest one was in 1971, when India split Pakistan in two and Bangladesh was born. India is the natural hegemon of this region but the structure is very much bipolar. The population of Pakistan is about 173 million, whereas India is almost seven times as populous with about 1.17 billion inhabitants. Pakistani GDP is about $204 billion, and India weighs in at a hefty $1.84 trillion making it nine times bigger. The military balance of power is similarly skewed: military spending is $45 billion in India and only about $5 billion in Pakistan. India has been expanding it’s lead in all indicators of state power since 1947. The power gap was much narrower in the early postwar period. The United States has consistently provided military assistance to Pakistan which has been a client throughout the period but it does not have a security commitment to Pakistan. Therefore, Pakistan feels extremely threatened by India. It even fears outright annexation. India has also securitized Pakistan intensely. It has a large Muslim population of about a 170 million or about as many as there are in Pakistan. In periods of sectarian strife–which are quite regular–it fears Pakistani meddling. Pakistan sponsors numerous Islamist militant groups that regularly carry out terrorist atrocities in India. Training camps dot the region around Peshawar. Bankrolled by Saudi petrodollars, these camps serve a dual function of providing a safety net to the large unemployed tribal population in the North-West territory, and promoting salafi ideology. The Pakistani intelligence agency, the ISI, is a state within a state. It is the control center of the Pakistani military and conducts Pakistani security policy independent of any civilian institutions. At least since the Afghan conflict began in 1980, it has patronized jihadi groups that target India. The CIA led effort to support the Mujahedeen fighting against the Russians was conducted through the ISI. The funding increasingly came from Saudis as the conflict wore on. Many of these groups survived the end of that conflict and ISI continued to patronize them even as they spread out like a cancer, penetrating Kashmir, Chechnya, the Philippines, Xingjiang, Indonesia and elsewhere. The CIA has long withdrawn but the Saudi-ISI-jihadi nexus has endured. This has led to increasing radicalization, growing sectarian tensions, and mounting instability in Pakistan itself. The economic dynamism in India over the past two decades has created growing ambitions to be a great power. It has started viewing Pakistan less as a serious threat and more as a nuisance. The concern over Pakistan based terrorism has endured even as India has begun to securitize instability in Pakistan itself. It is likely that Pakistan will become more unstable, which is a major concern for global powers because of its nuclear stockpile. This is the context of the fast deteriorating US-Pakistan relationship. US policymakers are increasingly viewing Pakistan not just as a strategic liability, but as a nearly pariah state. Concerns are growing over nuclear proliferation and Pakistani patronage of the jihadi network. China has been a strategic patron to Pakistan and has supplied it with crucial missiles (like the Gauri which is manufactured on the North Korean Nodong II blueprint) and perhaps even provided assistance for its nuclear program. This nexus is called the strategic quadrilateral. Major issues for the future of this RSC are therefore whether India will transcend the RSC–desecuritize its relationship with Pakistan and/or be seen as a credible threat by China–and whether Pakistan will collapse amid growing domestic instability. Both are unlikely in the short term but are distinct possibilities for the medium term. Either development would mean the end of bipolarity. The first would create a centered RSC in South Asia, which would be a remarkable structural development. It would make it more likely that India will emerge as a great power perhaps taking over the burden of protecting the Indian ocean. A Pakistani collapse may or may not be conducive to the rise of India. That will depend on whether the instability will spill over across the border–a scenario that is not unlikely. Another significant development that is possible is a strategic alliance between India and the United States aimed at containing China. In the previous post, we saw the US effort to create a security umbrella in East Asia. The thing to note is that there are no real strategic partners for the United States except Japan. All other powers (Australia, Indonesia, Korea et cetera) merely provide bases for the projection of US power. By themselves they are too weak to add strategic heft needed to contain China at a reasonable cost. India–if it sustains its economic dynamism for another decade–will be different. Even though it may not in itself be threatening to China, its large military and growing power projection capabilities would provide the United States with a partner that would give it significant strategic heft. In particular, it would be able to counter Chinese power in the Indian ocean, freeing up US resources for deployment in the East. However, this development will have to wait for India to grow up. Turkey and Israel are the two industrialized powers of this complex. Both are clients of Washington and have a completely desecuritized relationship. This is despite widespread Turkish opposition to Israeli treatment of Palestinians. Last year, Israeli commandos boarded a Gaza bound flotilla flying the Turkish flag and killed 9 Turks and an American activist. Turkey raised a lot of brouhaha but refused to securitize the issue. A Turkish court has indicted senior Israeli military generals but it is unthinkable that Turkey would challenge Israel militarily. The Turkish military has a history of independence and close ties to Washington which it is loath to jeopardize. Turkey has instead sought integration with Western Europe and remained a reliable NATO ally. It has not played a role in the complex apart from interfering in Iraq and other playing fields to protect its interests, usually to crush the Kurdish resistance. In particular, it has refused to balance Israel and excused itself from Levant security issues all together. The natural hegemon of the Eastern Mediterranean complex is Israel. The complex was born with Israel the usual way: with a war in 1948. The nascent Jewish state fought for its existence in a Levant still somewhat overlaid by European powers. In 1956, the US opposed a Franco-British-Israeli invasion of the Suez canal and sided with Egypt, thereby humiliating the European powers into withdrawing from the Levant. Washington was trying to cultivate Nasser who was also being wooed by the Kremlin. This was the late fifties and the Soviet Union was at the height of its relative military power which reached a global maximum in 1960, when it fully matched the United States in land-based military power and strategic bombing capacity. The Arab-Israeli detente (1948-67) took place when both the system level and the regional level were bipolar. Egypt and Syria briefly coalesced to form the United Arab Republic in 1958. At this point Israel had not yet industrialized and modernized its military. There was thus a balance of power in the Levant. By 1967, Israel has had already grown more powerful than its Arab foes. In a six day blitzkrieg, Israeli forces annexed the Gaza strip and the Sinai peninsula from Egypt, the West Bank and East Jerusalem from Jordan, and the Golan Heights from Syria. The Arab powers tried repeatedly to conquer Israel for the next 5 years but were repulsed by Israeli military prowess. The conflict continued in a dynamic punctuated equilibrium till 1973 when Kissinger made it unambiguous that the United States would not allow Israel to be defeated in a major war. Since then the Eastern Mediterranean has been under Israeli hegemony. The advent of Israeli hegemony in the Eastern Mediterranean and the Islamic revolution in Iran changed the structural relationship between the the Levant and the Persian Gulf complexes. Mutual securitization between Iran and Israel has integrated them into one single regional security theater. We should thus regard these two as sub-complexes of a larger Middle East complex that came about in 1979. It still makes sense to analyze them separately because they do have significantly different dynamics. While an uneasy peace prevails with the Arab powers, Israel has conducted a proxy war with Iran and Syria in Lebanon. The conflict in Lebanon has a mosaic of actors patronized by different powers. Hezbollah emerged in response to the Israeli invasion of Lebanon in 1982. It earned the permanent wrath of the United States with the Beirut car bombing that killed 240 marines. Israel has thus enjoyed consistent US support for its campaign to eliminate Hezbollah. Each time Israel has tried to crush it with force, it has emerged politically and militarily stronger. It has also enjoyed increasing support from Iran and Syria. Since the 2006 invasion, it has increased its stockpile of missiles capable of reaching Israeli settlements. The prospects for the Levant complex are highly uncertain. This is a period of major upheavals in the region. The outcome of the Syrian crises is as yet unclear. Although Hezbollah would certainly survive the ouster of the Assad regime, it would be much weakened by the loss of a major patron. The possibility of an Israeli surgical strike on suspected nuclear sites in Iran cannot be ruled out–along with all the inherent possibilities of a larger conflict–even as negotiations continue between Western powers and Iran. The biggest wildcard in the game is Egypt. The Muslim brotherhood seems set to come to power. It is not clear if the elected government in Egypt will be able to control the military and conduct its own security policy. As of now, this seems highly unlikely. If a Brotherhood-led Egyptian government does gain control of the security apparatus–something that cannot be ruled out despite the assurances of the generals–the Arab-Israeli peace would be jeopardized. It is quite unlikely that Israel would relinquish control over the occupied territories or refrain from further expansion of settlements. The Palestinian issue with thus continue to fester. With a radicalized Sunni regime coming to power in Syria, we might have a perfect storm on our hands with a third round of major Arab-Israeli interstate conflict likely in the medium term. In the next few years, the regimes in Egypt and Syria are bound to be busy with consolidation of power at home. Therefore, conflict with Israel in unlikely in the short term. This is the reason why the United States prefers the Yemen model. It prefers stability in Syria and fears a collapse of the Assad regime not just because Syria could descend into chaos, but also because an autonomous revolutionary regime instantly creates the possibility of opening the Pandora’s box that Kissinger closed in 1973. The Western edge of Eurasia is the longest enduring balance of power system in history. Much of this history is too well known to reiterate. Until it was overlaid by the superpowers during the Cold War, Western Europe was home to at least two great powers at any given time since the seventeenth century. Why was this the case? Western Europe has the highest ratio of coastline to land-area, the lowest elevation, and the greatest proportional extent of plains in the world. It enjoys a mild climate thanks to the Gulf stream. The Great European Plain is highly fertile and drained by many rivers keeping transport costs low and markets integrated. 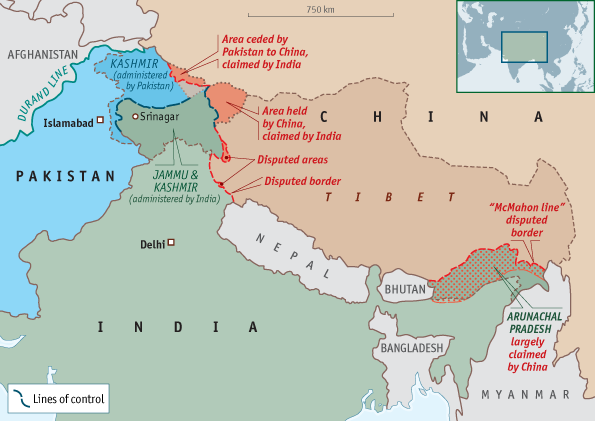 There are just enough natural barriers to make political unification militarily difficult. The division of Charlemagne’s empire into three contiguous blocks by the Treaty of Verdun in 843 CE provided the “birth certificate of modern Europe” [Pierre Riche]. But the European miracle had to wait for the emergence of the European world-economy in the aftermath of the Black Death. The division between Eastern and Western Europe “turns on the the difference between the heritages of the western and eastern branches of Christianity in the shaping of the political and social institutions.” [Findlay and O’Rourke, Power and Plenty] A north-south border has divided them for a thousand years, remaining within a stretch no thicker than fifty miles. After the Black Death, there was a sustained rise in per capita income in the West, even as it led to an intensification of feudalism in Eastern Europe and decline in the Islamic world. Western Europe lay at the periphery of the Islamic world in the first half of the second millennium CE. Following the devastation of the Black Death in the middle of the fourteenth century, a nascent European world-economy emerged in the sinews of the Levant system dominated by Muslim powers. This was a unipolar world-economy, squarely centered at Venice and the Italian city states. Around the middle of the millennium, the European world-economy had become decidedly bipolar, as the center of gravity shifted North. Around the same time, the European world-economy broke out of the Mediterranean and began to colonize the New World and the Indies. There was a marked divergence between the two dominant trends–capitalist development and balance of power–during this period. The big territorial power was Spain, the very last time a Mediterranean power was to dominate European affairs. Soon, the center of gravity shifted permanently North. The long seventeenth century–the period of Dutch hegemony–was a period of consolidation for the world-economy as it spread its tentacles around the globe. At the beginning of the eighteenth century, the core of the world-economy was still in the North-Western extremity, with the dominance of Holland reaching its peak around 1720. The half century of Dutch decline that followed saw the emergence of the big national economies of Britain, France and Germany. With the collapse of Dutch power in the late eighteenth century, the European world-economy went through a period of systemic chaos: revolution, war, and the rise of nationalism. This chaotic period of war and upheaval (1776-1815) saw the reconstitution of the world-economy and the establishment of British hegemony, as well as the emergence of the classical European balance of power system. British hegemony was critically dependent on maintaining its naval supremacy, which it managed with increasing difficulty till the twentieth century. Pax Britannica lasted for a hundred years. During the first half of the long nineteenth century the European world-economy came to dominate the entire globe-integrating all the inhabited continents and making Europeans the masters of the planet. The dynamics of the European balance of power in this period are the primary data that Realism has sought to explain. The order was decidedly tripolar. The dominant story was the rise of Germany and the waxing and waning of other great powers (Russia, Italy, Austria-Hungry). Britain managed the system as an off-shore balancer: by counter balancing any continental power that emerged as a potential hegemon. A second major development was the emergence of industrialization as the dominant determinant of military power. Britain was the first to industrialize and consequently reached an early peak of relative power around 1850 when it accounted for 70% of European wealth. The next twenty years finally saw the unification of Germany and a radical shift in the balance of power on the continent. The second half of this period (1870-1914) saw the industrialization of United States, Germany, and Japan. By the turn of the century, Britain was no longer the dominant system level power, and British hegemony became increasingly weak and ineffective. Not surprisingly, the balance of power had collapsed by 1913. There followed another lengthy period of systemic chaos. The Great war was followed by revolution in Russia, the collapse of the world-economy in the 1930s, and the rise of Fascism in Germany. Another system-wide conflict had to take place before the world-economy got reconstituted under a new hegemon. In the Cold war period (1945-89), European dynamics were completely suppressed by superpower competition. Faced with the threat of annexation by the Soviet Union, European powers sought American protection. The United States consistently encouraged European integration and the creation of a security community under the umbrella of US power. This was the origin of the EU as I have discussed before in the context of the euro crises. Buzan and Wæver, writing in 2003, wondered whether the EU would acquire actor quality in security issues. At this point, it seems highly unlikely. What we are observing is rather more of the same. German geoeconomic hegemony has intensified. At $3.3 trillion, German GDP is already much bigger than that of France ($2.5 trillion), and Britain ($2.2 trillion). Parenthetically, it is interesting to note that if France were to have its own currency, its GDP would be much smaller in US dollars, being overstated right now because of the relative strength of the euro. Whence, these numbers understate the relative economic heft of Germany. Not only has the rise of Germany continued unabated, so has the rise of the North with respect to the Mediterranean–a trend that is now centuries old. Much has been written about the divergence between the rich northern economies and the struggling southern European economies so I will leave it there. In the medium term, it is quite unlikely that economic chaos would lead to a breakdown of the EU security community. Mutual securitization between the three is very much off the table, as is the prospect of any of them leaving NATO and American protection. However, in the long term, a German exit from the US-led security community of Western Europe cannot be ruled out. The euro crises may very well end with a German dominated core of northern countries that eventually emerges as an autonomous actor. These developments are highly speculative but Buzan and Wæver are right in that if such an actor were to emerge in Western Europe, it would automatically be a great power. Regional security complex theory is a powerful lens. Especially in the current period of unipolarity and given the invariants of US foreign policy, the vertical division of the security order (system-, interregional-, regional-, and domestic levels) helps us analyze security dynamics across the global chessboard. There have been other attempts to create an overreaching framework of analysis. For instance, The Grand Chessboard, where Zbigniew Brzezinski takes in Eurasia in a panoramic view. But he gets it badly wrong at places because he doesn’t fully understand interdependence. To be fair, his focus is on US policy and not understanding independent dynamics. Another one is Robert Kaplan’s Monsoon, where the organizing idea is the Indian Ocean. While providing for an interesting narrative, it fails miserably in its explicit goal of providing an organizing framework. Look what Gause did with the theory of regional security. After that, reading Kaplan and Brzezinski is like reading a high school essay.